After a smooth check in, we decide to spend the first day exploring our beautiful retreat, unwinding at the private beach which can be easily accessed by a private hill tram. The seductive mix of balmy breeze, foaming edges of the majestic ocean and jungle vistas eased us into the magical Bali spirit. Mom and I enjoy a barefoot stroll along the sandy beach at sunset, while the boys play an impromptu volleyball match with a group from Thailand. Dinner is freshly-cooked pizza, succulent grilled meat and gastro salads at Karma Beach Club, the informal beachside cabana restaurant of our retreat. Food definitely tastes better at a beach! My advice: Wherever you stay, take the first day to relax and unwind. This prepares you to start your local holiday with fresh energy. TIP: Don’t miss the warungs (small, family-owned restaurant or cafés) that serve Balinese specialities in a simple setting. However, choose your eatery wisely. Bali belly (upset stomach or travellers’ diarrhoea) is a common phenomenon. 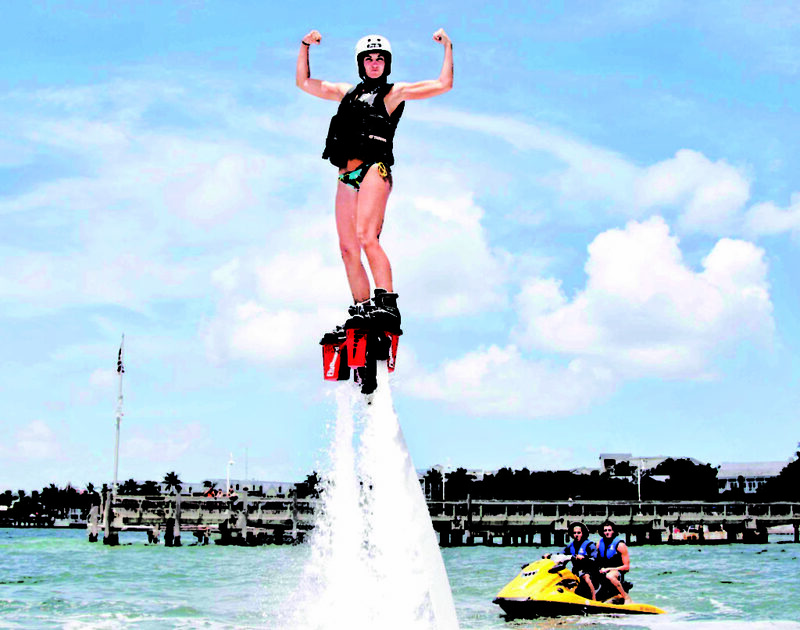 Bali is a hotspot for lovers of water sports. We spend the morning sea kayaking and snorkeling in the reefs and paddle boarding at our private beach. You could head to Nusa Dua, one of the best-known areas for watersport in Bali. Go snorkeling, parasailing, flying fish, jet ski, banana boat and wakeboarding—there are experts to guide you through it all. Afterwards, enjoy a quick lunch comprising nasi goreng (fried rice) and mei goreng (fried noodles). Expect rice or noodles with spices, vegetables, shrimp, topped with fried egg and served with a side of fried crisps. From beautiful flower-petal offerings placed everywhere to colourful and elaborate temple ceremonies, Bali is a deeply spiritual land. It has more than 10,000 temples, known for their spectacular structure and architectural details. Among the most breathtaking is the 10th-century Uluwatu temple which stands atop a steep cliff, around 250 feet above the Indian Ocean. Hang around until sunset to witness the stunning molten skies and the daily Kecak dance performance at the adjacent cliff-top stage. 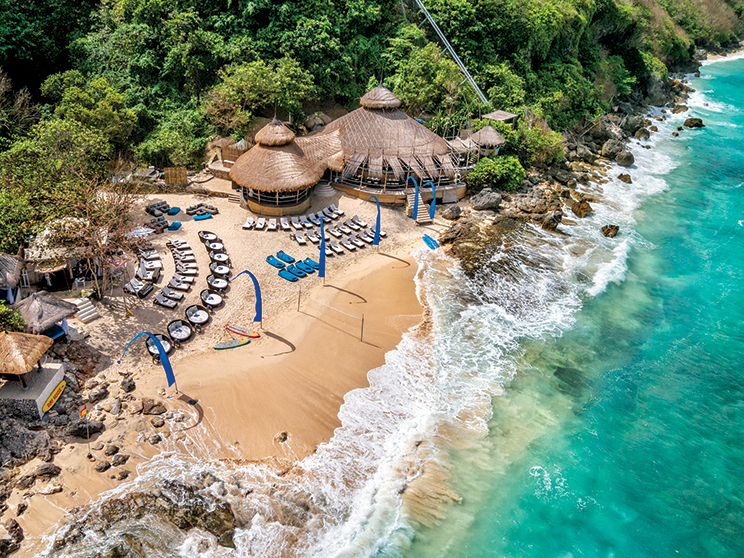 A tranquil fishing village on Bali’s southwestern coast, Jimbaran is known for its exquisite restaurants and lavish hotels that attracts celebrities from across the world. For dinner, I’d recommend Belmond Jimbaran Puri’s Tunjung Restaurant that combines the stunning views of Jimbaran Bay with authentic Indonesian flavours. In this idyllic setting, executive chef Adi Wijaya dishes out his version of Balinese specialities like Gado Gado (Indonesian style steamed vegetables rolled in rice paper served with melinjo crackers and peanut sauce) and Bebek Betutu (Traditional Balinese slow-roasted duck leg marinated with 16 local spices wrapped in banana leaf, served with lawar salad and sambal condiments). After a hearty breakfast, set out for a day trip to Ubud, Bali’s cultural and artistic heart. Though we spent only a day there, I would suggest keeping more time; there’s simply so much to see and soak in! Make your first stop at the Sacred Monkey Forest, a lush jungle sanctuary full of cheeky little macaques vying for attention. Make sure your bags and pockets have no food or glittering items. Now for a cup of coffee. But because you’re in Bali, it has to be the world’s most expensive and unusual variety, made from—hold your breath—cat poop! You read that right. Kapi Luwak is sourced from the faeces of civet, a cat-like animal native to Indonesia. Coffee tasting at the Kopi Luwak plantation is one of the most interesting culinary experiences in Ubud. After learning all about the processing of coffee, you’re presented with a wooden tray with about 12 tea and coffee samples which includes flavours like vanilla, ginseng and coconut. The rice fields are up next, and it is like stepping into an Instagram postcard! The neatly layered terraces of Tegalalang rice fields line the side of Ubud’s famous green hills, making for a stunning view that has to be seen to be believed. Spend some quiet time observing the splendid greenery at one of cafes overlooking the rice fields before hitting the local markets for a spot of shopping. From batik sarongs, Balinese masks, wooden bowls and home decor to tees, bags, dresses and handicraft items, Ubud Art Market or Pasar Seni Ubud is a paradise for street shopping. Before you leave Ubud, make a stop at the Goa Gajah ‘Elephant Cave’ which dates back to the 11th century. 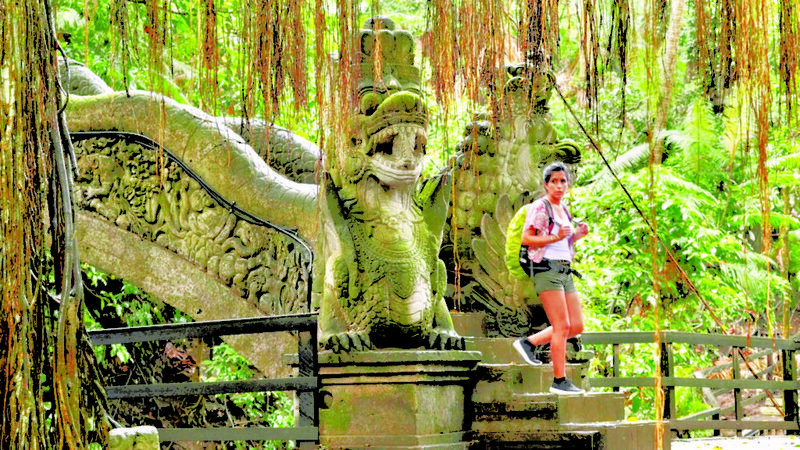 Located on the cool western edge of Bedulu Village, six kilometres out of central Ubud, it was originally built as a spiritual place for meditation. Today, it is worth spending an hour here, descending to its relic-filled courtyard. You’ll see interesting rock-wall carvings, a central meditational cave, bathing pools and fountains. 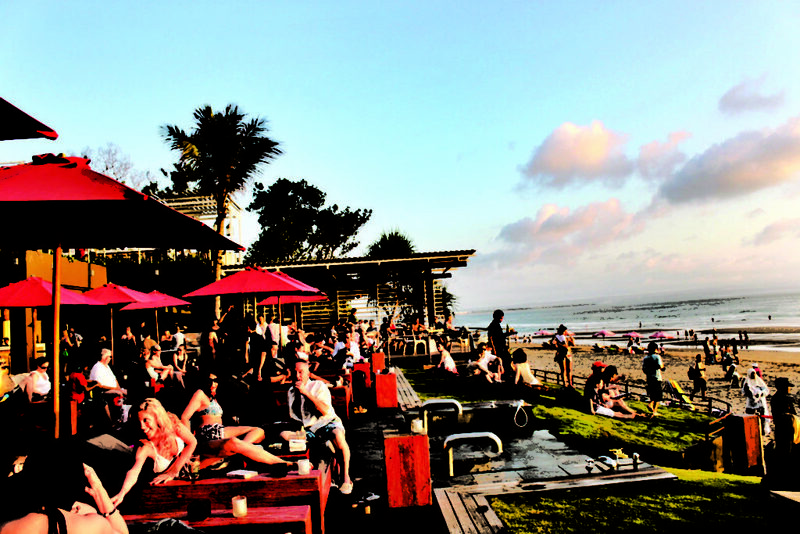 After your fill of beach time, get ready for some hedonistic fun in party capitals Kuta and Seminyak. At Kuta Beach, it’s just fun to soak up the sun and sip on refreshing coconut water sold by local hawkers. Kuta’s main beach road Jalan Pantai is dotted with little stalls and stores selling everything from knitted beach wear and round, basket-style rattan bags to fridge magnets and interesting souvenirs. Don’t miss Fipper— a store where you get slippers in every possible style and colour, and that too for a steal! A stone’s throw north, Seminyak is Bali’s shopping headquarter. Its alleys are packed with everything from designer boutiques (Paul Ropp, Lulu Yasmine) to homewares, art and antiques stores (Enfants Paradis, Saya Gallery) and independent beach and surfwear shops (Drifter, Blue Glue). Its cool cafes and slick bars have popular bands and DJs performing regularly, as well as a host of dining choices run by renowned international chefs who have made Bali their home. We spent an evening at the hot spot beach bar, Potato Head, housed in a quirky u-shaped building overlooking an infinity pool, facing the ocean. Order for appetisers and cocktails at the poolside bed and take a dip at intervals before joining the dancing crowd as the night sets in. Visa: On arrival, so no hassle. The queues move fast, too. Flight Tickets: We booked a Malindo Airlines flight from Mumbai to Ngurah Rai International Airport (Denpasar). It takes about 10 hours, including a stopover in Kuala Lumpur. Hotel(s): We booked ourselves in a two-bedroom villa at Ungasan, 45 minutes from the airport. Karma Kandara is a cliff-top hideaway overlooking the Bukit Peninsula. Our villa boasts of a tropical courtyard and private pool and beautifully blends traditional Balinese architecture with natural stone elements. Local Tour: We booked our Ubud Day Tour through Klook which is a wonderful experience planning application. From bar hopping and adventure activities to day tours in Bali, you have a wide range of experiences to choose from. Plus, their drivers arrive on time and are quite flexible with the itinerary. TRAVEL SMART: In Bali, you’re never far away from a massage. Seminyak is packed with massage parlours for every budget. What’s more, you can also get your hair braided here!. When in Bali, feel free to bargain, just like you do in Indian cities. Don’t be afraid to quote a straight 50 pc below the price tag. If bargaining is not your thing, visit Krisna, a large souvenir store on Sunset Road. Their prices are fixed but much lower than at a local market. Bali is a crowded island and traffic jams can be a pain. Consider renting a scooter to drive around packed areas like Kuta and Seminyak. Scooter rentals cost around 50,000 IDR per day, which comes to about INR 240. Local taxis are a good option, but make sure you book government-recognised metered taxis by Blue Bird Group. Avoid drivers who ask for a fixed price and go by the meter.